Message received on October 8, 2015 from Cathy Tuttle, Executive Director of Seattle Neighborhood Greenways. 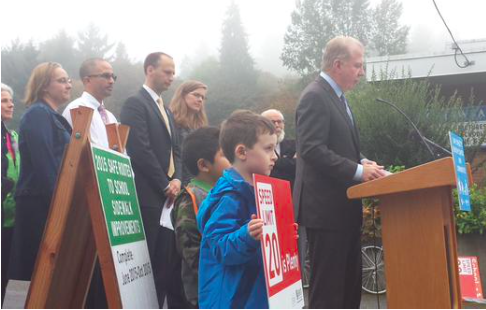 It is with great pleasure that we join with SDOT today in celebrating the launch of our city’s Safe Routes to School 5 Year Action Plan! You got a sneak preview of the Action Plan last week PLUS a chance to hear about Safe Routes directly from Brian Dougherty, SDOT’s amazing Safe Routes Coordinator. We’re hoping to repeat the workshop in the south end when Brian has some time this winter. Here is a video of Brian’s talk — well worth watching and sharing. Pre identify routes before you go out with a larger group. Travel along routes with no more than five to eight people. Make sure your walk isn’t too long — focus on areas of greatest concern. Choose your walk time so you can watch as kids are entering or leaving school – when you can see how children use the road. Focus on problems, not on solutions. Learn who is responsible for what — who owns the property causing the problems. I appreciate your involvement in making your local school routes safe. I hope you got a lot of value out of our workshop. We did!